Varanasi or Benaras situated on the banks of River Ganges in Uttar Pradesh is one of the most important Hindu pilgrimage centers. We can find references of this ancient city in the Vedas. Many temples sprawls throughout the length and breath of the city. The ghat in the city still carries that old world charm. Narrow lanes, crowded streets, people performing yagnas in the Ghats while taking a dip in the holy river, road side shops selling knick knacks are some of the characteristic feature of this city. The regions near the Ghats are extremely populated and house some of the renowned Hindu temples. Each of the Ghats here has a story behind it like Dasaswamedh Ghat is where Lord Brahma is supposed to have sacrificed 10 horses in a yajna. 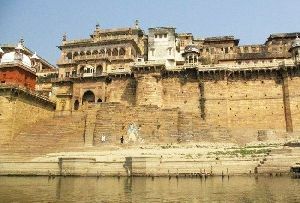 Check out the many Museums in Varanasi to understand the true implication of the city. Bharat Kala Bhavan located in the premises of Benaras Hindu University Campus showcases a number of objects dealing with arts and architecture. This is one of the oldest museums in Benaras. It was set up in 1920 A.D.
Bharat Kala Bhavan displays India’s heritage at its best. It showcases many priceless objects which bears testimony to the richness of our country. It is opened from 11 A.M to 4.30 P.M. Rabindranath Tagore was its first honorary chairman. However the full credit for its development and up gradation goes to late Rai Krishnadasa who was a renowned writer in Hindi. The museum is divided into different sections like Mahamana Malaviya gallery, Nicholas Roerich gallery, Chhavi or painting gallery, sculpture gallery, archeological gallery, Nidhi (treasure gallery), and decorative art gallery. This museum is one of the best preserved museums in the whole of India. The main hall of the Bharat Kala Bhavan consists of the finest art, sculpture and painting collections. One of the figurines which is quite popular is that of Lord Krishna standing on one leg and one hand on his hip while trying to lift a heavy stone with the other hand. It has been interpreted as Lord Krishna trying to lift Mount Govardhana. A bronze image, terracotta figures and miniature paintings during the time of the Mughal period also finds a place in the museum.